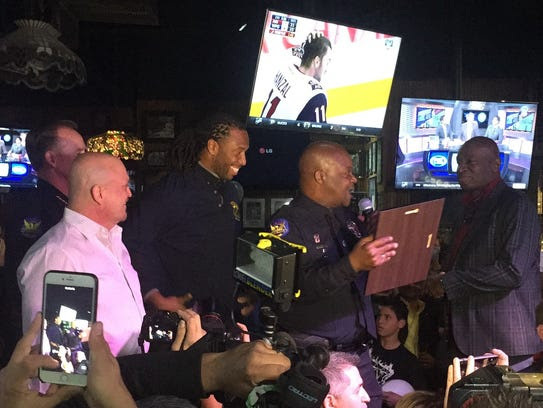 Larry Fitzgerald and Roy Green were in for a surprise at a Phoenix police fundraiser Tuesdaynight. 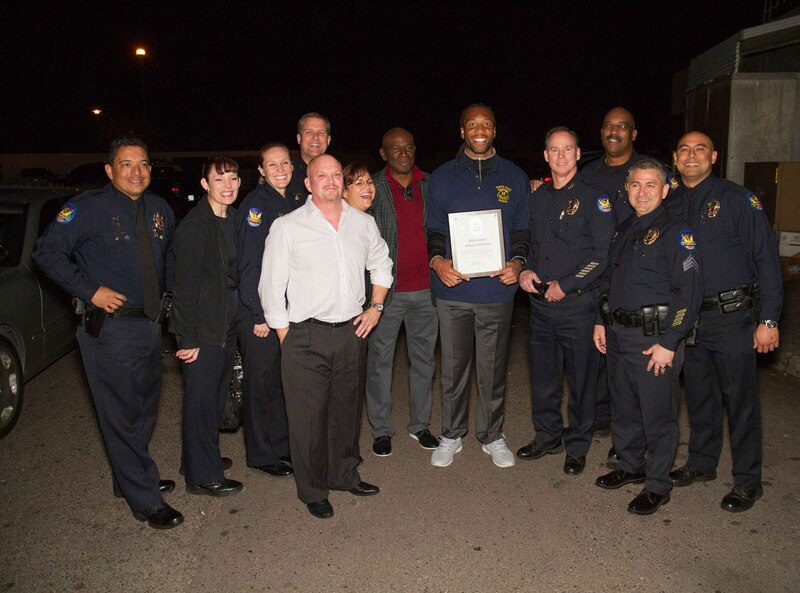 The event featuring current and past Arizona Cardinals wide receivers was set up to support the Phoenix Police Foundation and raise awareness about sleep apnea. Along with the fundraiser, Green hosted the grand opening of the Arrowhead Pro Sleep clinic, which was a sponsor for the event along with the Arizona Cardinals. It was a packed house at Padre Murphy’s on West Bell Road. 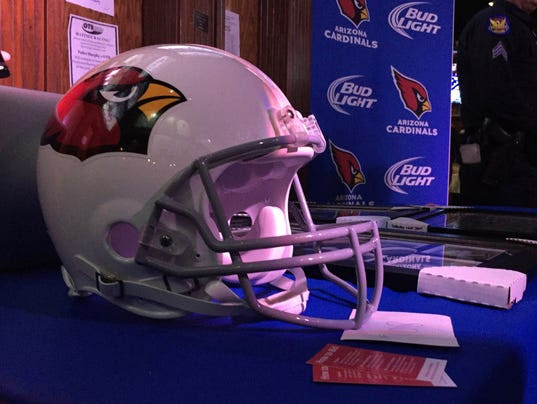 Cardinals fans positioned themselves close to the main stage to ensure prime viewing angles when Fitzgerald arrived. The crowd burst into cheers when Fitzgerald was introduced. He addressed fans on why they were there. Officer James Holmes, Phoenix police public information officer, presented Fitzgerald and Green with plaques naming them honorary officers. The recognition, a surprise to the athletes, does not include a badge or any law-enforcement authority. The athletes and Phoenix police made sure the crowd was aware of Arrowhead Pro Sleep’s work, which is focused on the diagnosis and treatment of snoring and sleep apnea, according to Arrowhead Health Centers’ website. The Phoenix Police Foundation, according to its website, helps fund Phoenix’s K-9 unit; provides financial assistance to officers and their families; recognizes accomplishments of officers, volunteers and those fallen in the line of duty; and fosters community outreach. The foundation was created in 2002. Auction-goers got a chance to win a day of golf with Cardinals athletes and win Cardinals memorabilia in a raffle. Other NFL notables in attendance were Eric Dickerson, Marcus Allen, Mike Haynes, JD Hill, Frank Sanders, Derek Kennard and Jim McMahon. Arizona Attorney General Mark Brnovich also attended.